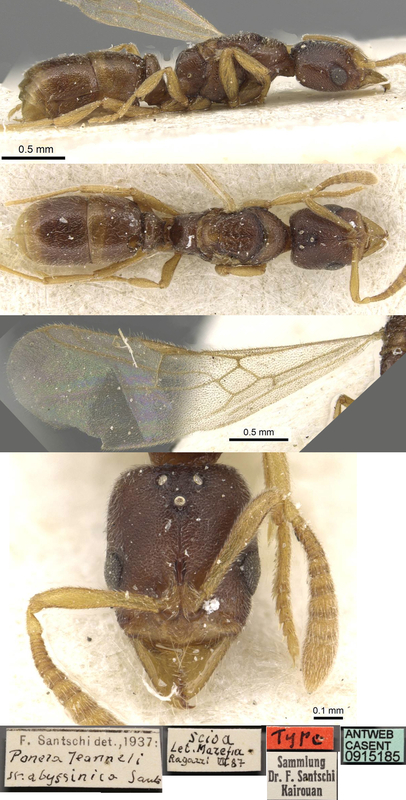 Worker and queen described (new combination in Hypoponera, in Bolton, 1995) . Provisionally synonymised under Hypoponera jeanneli by Bolton & Fisher (2011: 87). Santschi (1938b) however, gave the colour as dark brownish-yellow, head blackish brown. I therefore retain it as a distinct species. Santschi's (1938b) description is at . 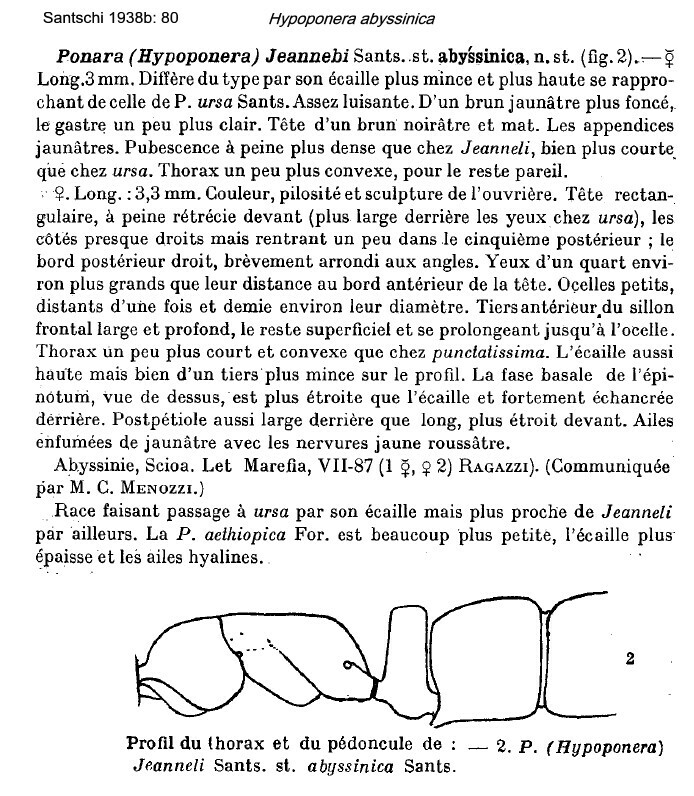 WORKER (from Guinea, after, Bernard, 1952) - TL in range 2.6-3.3 mm; differs from jeanneli (described from Kenya and Uganda) in structure of clypeus and thorax. 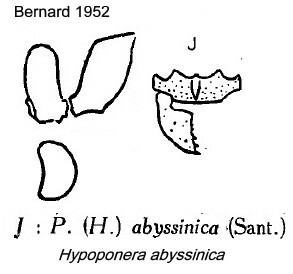 Identical to the types of abyssinica from Abyssinia - head more shiny, brown and eyeless, like dulcis but separable by clypeus and propodeum-petiole profiles; clypeus with distinct medial carina, mandibles with 3-5 teeth; body without flattened pilosity. From Guinea; common at Nimba, Mount Tô: locations B1 28, ravine 1 (8.11.1942), 3 workers, 1 queen; B1 30, ravine 1, 4 workers; B2 41, ravine 1 (21.ii.1942) 5 workers; Camp 1, 5 workers (Bernard, 1952). The photomontage is of a worker from Usambara Mts, Tanzania; Zigi Lodge, Amani NR; collector Vasily Grebennikov.